Cats are adorable pets. With cats around, one can never fall into depression. By every passing day, you fall in love with a cat and how it reacts to everything. Being a cat owner, you should be very concerned about the lifestyle of your cat. She should eat healthy in order to live a healthy and long life. There are many brands in the market providing cat food, but there are only few brands which your cat falls in love with. 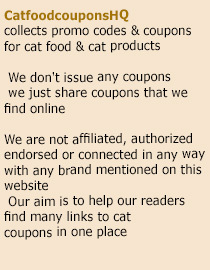 When you can save on your clothes, shoes, and what not through coupons, why not save on cat food? Here’s what we have got to inform you. One of the greatest cat food providers in the market is Nature’s Recipe. They have an amazing offer going on for everybody. All you have to do to avail it is like their Facebook fan page and you will save up to $5 on their NEW high protein recipe pack, which is also grain free. New Nature’s Recipe counts on every ingredient and adds no artificial flavors or colors in cat foods assuring that your cat would stay healthy with their food. Don’t miss this offer and just like their Facebook fan page to save money (expired). Get an 2-4.5 lb bag of Nature’s Recipe® dog and cat food for just $8.99. This discount is available at Petco.com. Check out all discounted Nature’s Recipe products at this page. This entry was posted in Nature’s Recipe. Bookmark the permalink.